uneekee's most luxurious fabric ever, custom printed with patterns by fabulous designers, uniquely yours. ï¿½ï¿½our 100gsmï¿½ï¿½bedding is made of an exclusive jersey and poly blend that has the exquisite feel of high thread counts, yet the material softens more each time you wash. keep cool in the summer and cozy in the winter. 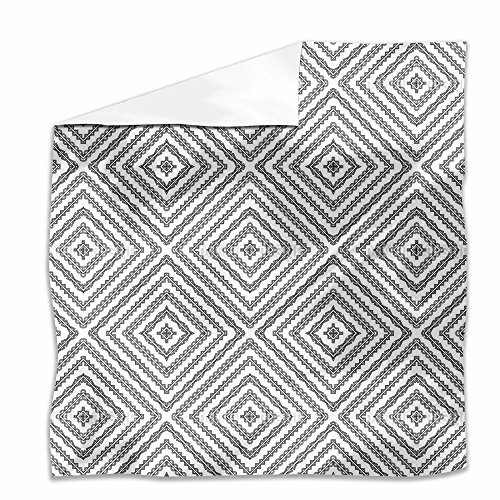 ï¿½ï¿½uneekee custom prints the bedding in 24 hours and ships direct to you in under a week. 100% guaranteed non-fade, non-bleed inks - custom printed in the u.s. - easy care, wash and dry - no ironing. Twin: 66" x 96"Queen: 90" x 102"King: 103" x 108"
Design By Laschon Robert Paul, patterndesigns.com Arabic black and white ornament.